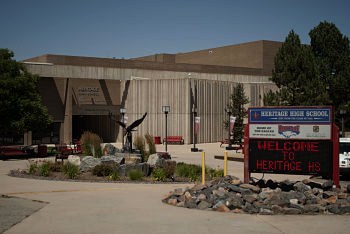 Now in its eleventh year, the collaboration between Heritage High School in Littleton, Colorado and Kabala Heritage High School is a story of vision, action and hard work. The students, their parents and faculty of Heritage High School in Littleton supply funds for developing and sustaining their sister school in Kabala, Sierra Leone. Fund raising started at Heritage High School in Littleton, Colorado. Construction begins on Heritage UMC High School in Kabala, Sierra Leone. Jungle is cleared and construction of the new school begins. Heritage UMC High School/Kabala (a Junior Secondary School) opens with a sister school relationship between the two schools. School opens with 100 students in grade 7. Enrollment increases as a second class is added for grade 7. A relationship is developed between Serving Sierra Leone and the Kabala School for the Blind. A community effort moves the School for the Blind from a dilapidated war torn residence to a new location with a new classroom building. Another 7th grade class is added bringing the total to three grade 7 classes. A new dormitory is built for the School for the Blind. SSL funds and develops a duplex for staff members of the School for the Blind. Kabala Heritage High School graduates its first class with the best exam record in the District and with all UMC secondary schools. They repeat this accomplishment in 2013, 2014 and 2016. Second class takes exams and scores highest in District and higher than 39 other UMC schools. Now has over 500 students, 12 teachers, 3 new classrooms being added. 2014/2015 school year is cancelled due to Ebola. In 2015 a rapid continuous schedule for all schools is developed to make up for the lost school year. In 2016 the schools are back to the standard school year. View the photos of Kabala Heritage High School under construction in 2008 and 2009.